It's just a confusing issue. As of now, it is 'fixed' again. It seems to 'fix' itself after the car has cooled down then runs just fine, a/c and all. I'll check the FSM tomorrow for a ground connection diagram. It's not uncommon for Thermal Changes/Temperature Changes to cause connection issues. When things "Cool Down" they work, etc. Possibly Demating/Mating the PCM connections will solve the problem by itself. Wiping any corrosion on pins etc. It doesn't cost anything. And a can of spray Contact Cleaner/Lube is under $10. I have some CRC 5103 around here some where. I'll try it out. Only mine seems to be intermittent. I honestly think it would be a good idea to wire a third "back up" fan somehow to a relayed switch. Probably not a good idea to mount it in front of the radiator though. I cleaned out the PCM contacts so we'll see what happens. Completely forgot there is a fuse in the cabin for the radiator fans. 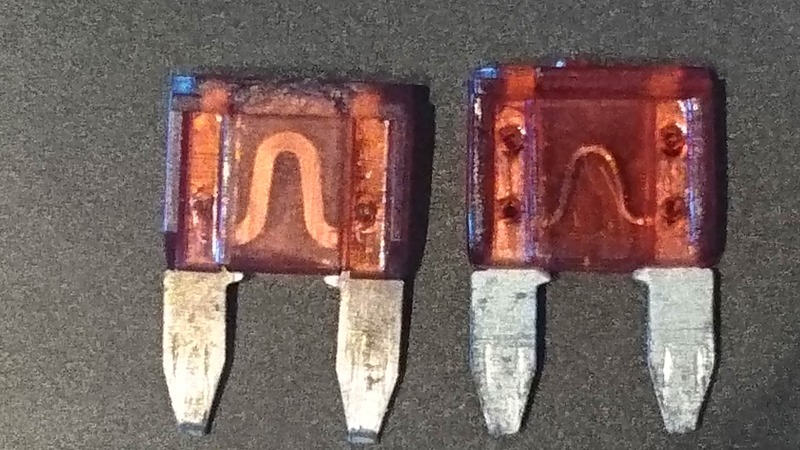 The one on the right was that fuse, compared to a different 10A fuse on the left. The fuse is also noticeably "loose" like the contacts are loose. Not sure if that'll be the cause but it could be that simple. Any way of tightening up the fuse contact points? Maybe a small screwdriver and carefully tweaking the metal contacts by bending them a little? Could be the source of the intermittant problems. Without looking at the wiring diagrams...I'd guess with that being a mini 10 amp fuse it's mainly for the relays and not the fan motors. You probably have a much larger fuse in the PDC under the hood for the motors. I mean the fuse itself rattles. Maybe just separated from the plastic. The fuse under the hood in the power distribution box is a 40A and looks fine. I know it still doesn't explain why the fans would run seconds after starting the car then kick off. Good work! Guess you'll find out if any of that was the root cause of your issues. So are you thinking the disconnect is in the low speed fan circuit? No clue. I'm just examining the pin locations on the 60-way connector to the PCM and all of the sensors required for fan operation seem to connect to pins within the same vicinity. If it happens again, I'm going to use a DVOM and check the connector at the fan to see if it is getting power. If the fans turn off and power is still being sent, then perhaps the issue is within the RFI module. I'm not sure exactly what the RFI module consists of. If there is a switch in there or if it is just a junction for the fans. Maybe it overheats and shorts out. I think it would be helpful for you to sketch the entire radiator control circuit from the FSM - everything from the PCM fan control outputs, through the two fan control relays, to the fan motors. Unless you do that, I don’t see how you can troubleshoot it down to point of failure. And what I said in my earlier post may start making sense. Well, it happened again but I think I've made a little progress. I was idling and a/c and fans turn off. Engine temp begins to rise so I shut the car off. But this time when I turn the car off and start it, I turn the a/c off and the fans keep running. I can't remember if I tried that the other day (could have swore I did) but the issue seems to lie with the a/c. So I tried again, started the car and kept the a/c on, fans turn off. However, WHY would my fans stay off if my car is overheating? I wonder if a failing alternator could cause this. Going to test it.